In The Works: Sákbe Roads! Here’s a photo of the prototype of our upcoming Sákbe road model. 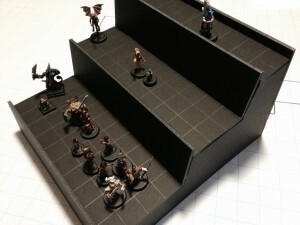 You’ll print out an 8-piece pattern, and use it to cut out the parts from a standard foamcore sheet. The whole process takes about half an hour. In the final version the pattern pieces with have a full-color texture – so you’ll glue them to the foamcore before cutting them out. 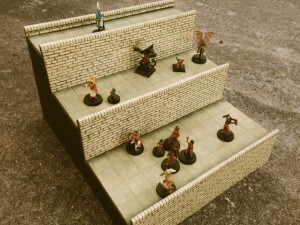 The result is wonderfully sturdy, and looks great on the tabletop! And here’s a finished example! The pattern pieces are printed in color on standard 8 1/2″ x 11″ paper, then glued to black foamcore before cutting. We’re very pleased with the results! Next we need to write up the instructions, and submit the final product to the Tekumel Foundation for approval. The kit should be available for download from RPGNow within a month. UNIgames proudly supports efforts to make 2015 – the 40th anniversary of Empire of the Petal Throne – the Year of Tekumel! 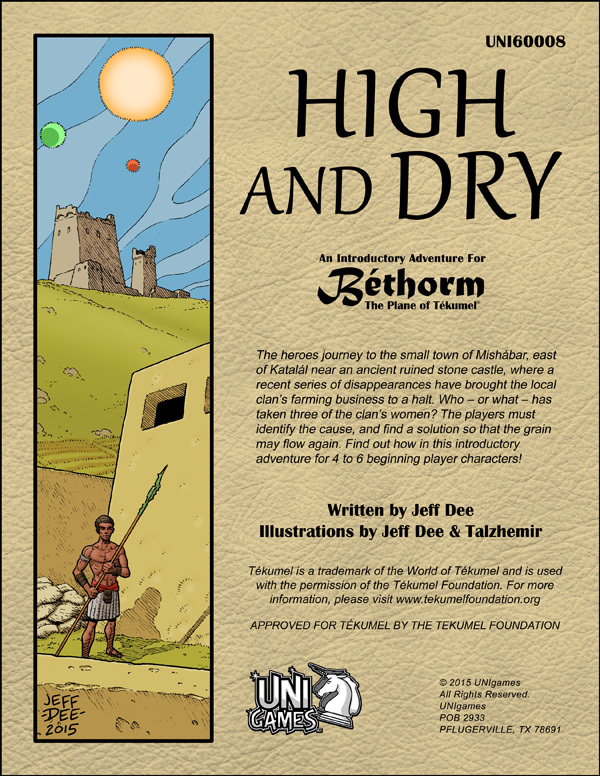 We have a lot of exciting things in the works, from Talzhemir’s ongoing series of Tekumel paper minis to our big Kurt Hill Map Set & Gazetteer, and many more things in between! We’re also scheduled to run games and give talks at several upcoming conventions in the coming year. Be sure to explore the tabs at the top of this page to find links to tons on Tekumel products, source material, and other resources. Bethorm.com is here to help inspire your Tekumel gaming, whichever system you choose. On to a glorious 2015! Ss’kik Ssa – Pe Choi Swordsman of the Black Old One! This character demonstrates nonhuman character construction, and multiple weapon use. Click the “Free Downloads” tab, above. Now that the game is out, our focus switches to supporting Béthorm with utilities and content. We’ve just added a new “Free Downloads” tab to the web site, where we plan to post at least one new freebie each week – at least until we run out of ideas! First up is a Tsolyani calendar, to help Béthorm GMs keep track of campaign time. It also references the Tsolyani celebrations and festivals from Prof. Barker’s Tekumel Sourcebook. There’s a printable PDF version of the calendar, as well as an Excel version for keeping track on your computer. Otulengba! Blank Tékumel mega-hex grid added to the Free Downloads page. Blank Béthorm character sheet PDF added to the Free Downloads page. “The Circle of Columns” adventure PDF added to the Free Downloads page. The PDF edition of Bethorm is now available to the general public on RPGNow, and has received its first review. Check it out here! 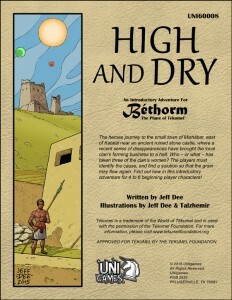 Béthorm: the Plane of Tékumel RPG has been Approved by the Tékumel Foundation. After one final week of proofreading and editing, the books will go to print! The Bethorm Kickstarter backer surveys went out this morning. Only backers who pledged for physical items will receive a survey; PDFs and other electronic media will be delivered by email. Otulengba!